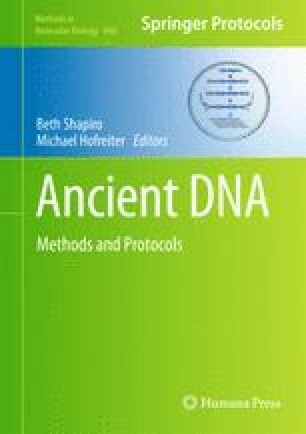 The myriad downstream applications of ancient DNA (aDNA) analysis all ultimately require that sequence data are generated from extracts of ancient material. DNA extraction from tissues known to contain preserved biomolecules (e.g. teeth, hair, tissue, bone) relies on subtle modifications of a basic technique that has been in use for nearly two decades. Multiple DNA extraction protocols have been introduced, with varying levels of success depending on tissue type and the long-term preservation environment to which the ancient tissue was exposed. Here, we describe the phenol–chloroform method for extracting aDNA from any tissue type. This commonly employed method allows for the recovery of total nucleic acid content with minimal loss of low molecular weight double-stranded DNA. Thanks to Beth Shapiro for the opportunity to contribute this chapter.